Rathcoole Commercial has taken delivery of a new DAF LF 170 from DAF Ireland’s Dublin HQ. It comes with a PACCAR factory box body that’s built from the assembly line at Leyland, England. The high spec LF series rigid truck has been designed with city driving in mind, with a high payload and a tighter turning circle. Rathcoole’s LF also features a full aero kit, luxury air driver seat, adaptive cruise control, forward collision warning, advanced emergency brake system, lane departure warning and rear underrun protection. It is powered by PACCAR’s PX-4, 3.8 litre 172hp Euro 6 diesel engine mated to a 5-speed manual gearbox. 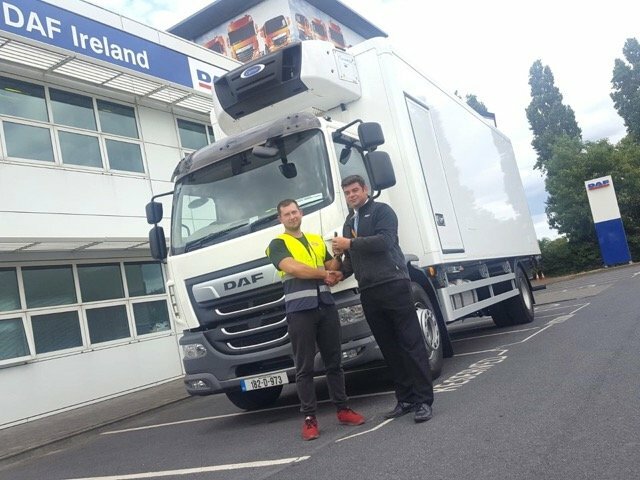 Pictured is DAF Ireland Dublin Sales Representative, John McCann handing over the keys to John Ward from Rathcoole Commercial. 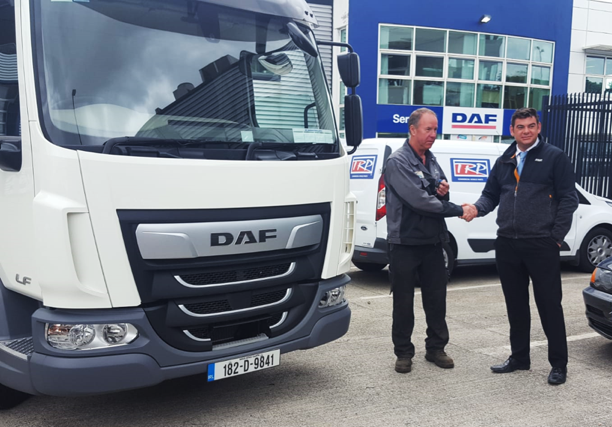 Recently, Maxela Ltd, the Century Business Park, St Margaret’s Rd, Jamestown Little, Dublin 11 based food distribution specialists, picked up its new DAF LF 260 refrigeration truck from DAF Trucks’ Ireland. The 18 tonne rigid came fitted with a Carrier Transicold multi-temp refrigeration unit and 2,000kg cantilever tail lift (supplied and fitted by Gray & Adams Ltd), making it perfect for delivering fresh and frozen foods to customers including supermarkets, cafes, restaurants and catering companies. Powered by a PACCAR PX-7 264hp engine with a ZF AS-Tronic automated transmission, the truck also benefits from a number of safety fittings such as forward collision warning system, advanced emergency brake, lane departure warning, rear LED’s, halogen headlights and aluminium fuel tanks. In the photo is Evghenii Oleninicov from Maxela Ltd, receiving the keys from John McCann.